Other Food: daily devos: Would we pass this test? TO CHEW ON: "Then Jesus lifted up His eyes and seeing a great multitude coming toward Him, He said to Philip, 'Where shall we buy bread that these may eat?' 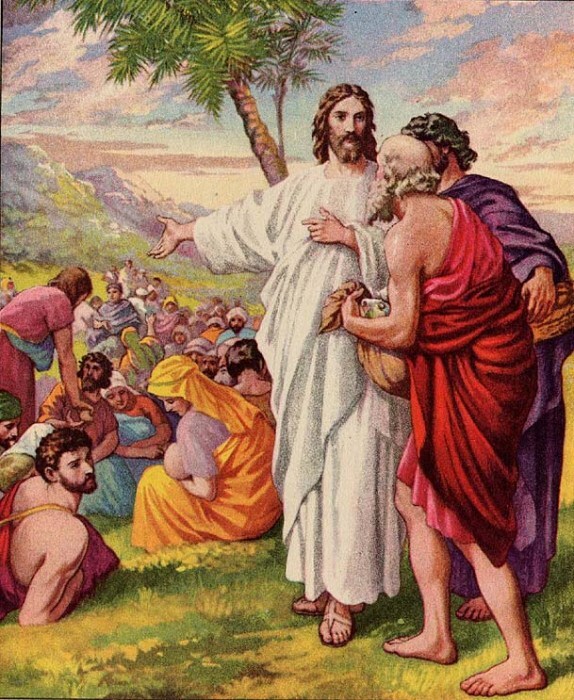 "
Jesus, seeing the crowds approaching, asks Philip, How are we going to feed these people? What a curious little aside John mentions here—cluing us in to Jesus' motives. For Jesus asks, not to get ideas or information. This is not a problem-solving brainstorm but a probe of Philip's own heart. It's a test. Philip answers, "Two hundred denarii worth of bread is not sufficient for them that every one of them may have a little." I wonder how Jesus feels about that response. It is realistic and practical. It focuses on the big need and the expense they will incur to fill it. But I can't help but think Jesus is disappointed in it. For there is not a whiff of faith here. Nothing to suggest that Philip has been impacted by Jesus' presence, that his faith has grown as a result of witnessing the healings and other miraculous signs Jesus has performed. (In my Bible's Harmony of the Gospels, Jesus does many miracles between His selection of the twelve apostles and this feeding of the 5,000 event. Philip has probably witnessed these: the centurion's servant healed - Luke 7:1-10; widow's son raised from the dead - Luke 7:11-17; sea calmed - Matthew 8:23-27; Gadarene demoniac healed - Luke 8:25-39; the twelve sent out to heal and preach - Luke 9:1-6). Somehow Philip's first response despite all he has seen and heard, is still to look at the big problem and cast about for a common sense, material solution. Aren't we also a lot like that? We view difficult people, accidents, challenges to our resources, illnesses etc. as things that shouldn't be happening to us. They're from the devil, we say. And in a way every problem and brokenness does have its roots in the falleness of us and our world. But here we see they may also be God-designed tests—the things that show God and us—mostly us—what we really lean on and trust in, where our confidence is. They demonstrate the focus, size and quality of our faith. PRAYER: Dear Jesus, when I'm challenged by life and circumstances, help me to perceive Your view of what this really is. I want to begin to pass these tests. Amen. MORE: How could Philip have passed this test? What answer from Philip do you think would have pleased Jesus (or maybe you think Philip's answer did please him)? What might a test-answering response to the challenges of life be for us? "Comments" would love to record your answers.